I hate spiders, but I love spider stitch patterns! I think a lacy scarf or shawlette (or whatever you like) would be beautiful in spider stitch on a lace weight yarn. I used a heavier weight just for the sake of everyone being able to see it in the above sample. I did a video way back of a spider stitch pattern, and being close to Halloween now, thought it was time to do another. This is a very easy stitch to master, don't let the 'K3tog' scare you away. If you are a tight knitter, you may want to try and knit a little more loosely than normal so you can work that part of the pattern. Also, some of the rows begin with a YO, and since I don't have any border stitches in my sample, you get to see how to do an YO at the beginning of a row! Aren't you excited?!? 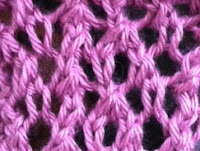 Repeat Rows 3-6 for the pattern. And as always, there is an accompanying video for this stitch. I apologize if I go a little fast, I usually film outside so I get good light, but it is cold and rainy today, and my fingers were starting to go numb from the cold. I was trying to hurry so I could get back inside! Hi, just wanted to thank you for the tutorials on stitches :) you do such a wonderful teaching job.